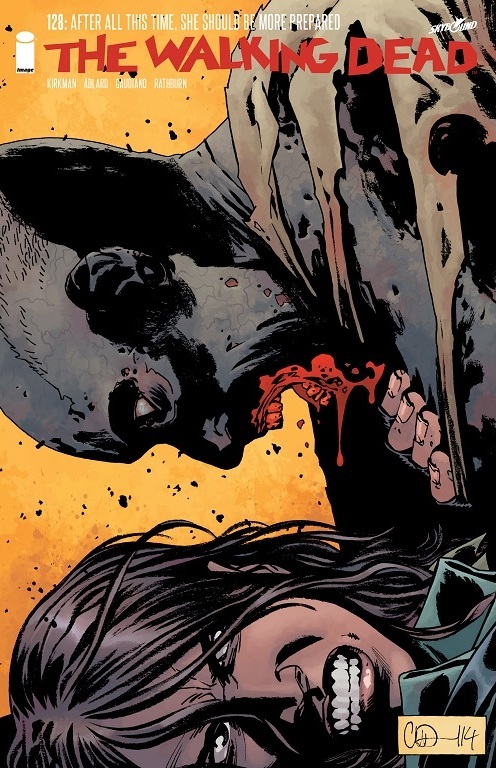 A Look at The Walking Dead #128: “After All This Time, She Should Be More Prepared” | What Else is on Now? 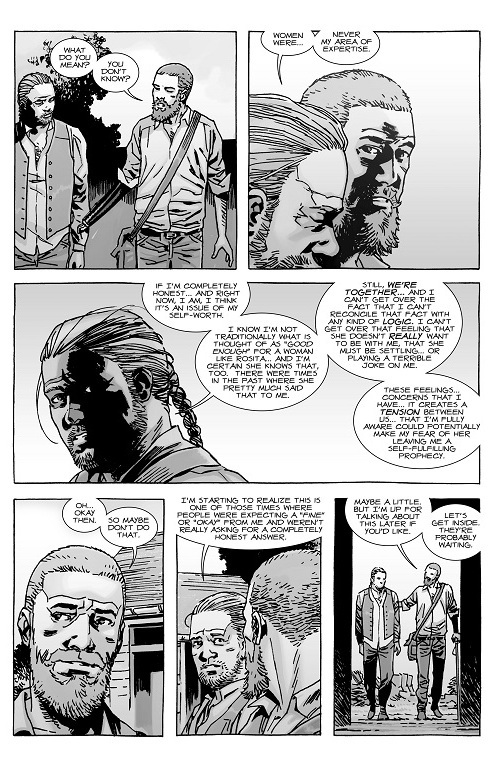 The Walking Dead #128 gave us a further look at life in Alexandria since the time skip. I don’t have a problem with the setup that this and the previous chapter have taken since it reintroduces us to the characters we’ve watched grow, but also introduces a new dynamic with Magna and her group of survivors. When so much of the series have emphasized the need to survive, it’s actually a nice change of pace to have a slower chapter that’s clearly building toward something, since Magna has her suspicious about Rick and everyone else. I doubt she has evil intent toward them or that they’ll suddenly turn into the villains of the arc. After all, it’d be foolish to just openly accept someone with open arms and not be suspicious of them in the slightest. I don’t think the newcomers intend to cause harm. They, like everyone else, are just suspicious. As Magna pointed out, if something looks too good to be true, then it probably is. From an outsider, Alexandria, like Woodbury, appears innocent enough, but you have this feeling that something sinister lies beneath the sunny surface. 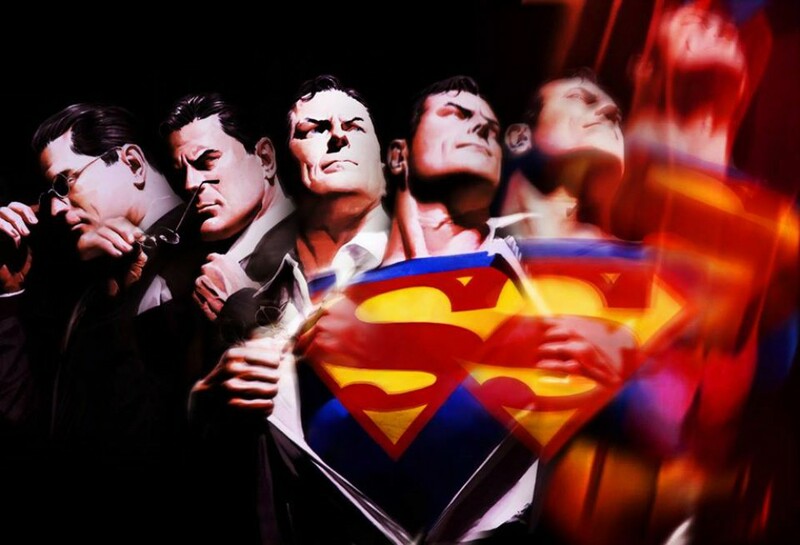 However, Alexandria, as far as we know, has maintained stability since the end of “All Out War.” It does sound too good to be true, so you have to wonder if Magna’s onto something that Rick and the others aren’t letting on. Going back to Andrea for a moment, I like the leadership role she’s grown into. 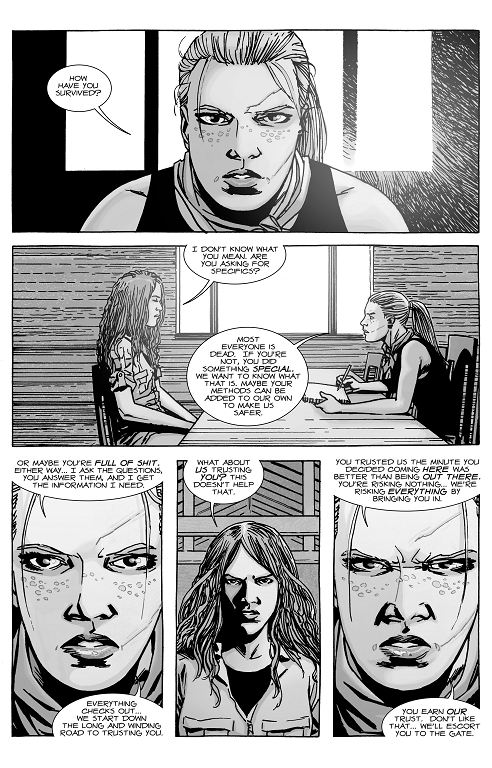 Before, Rick would be the one asking the list of questions and interrogating newcomers, but I can completely see Andrea taking on this responsibility. She’s already proven her worth as the best sniper the group has, so why not let her take on the task of clearing new people into Alexandria? 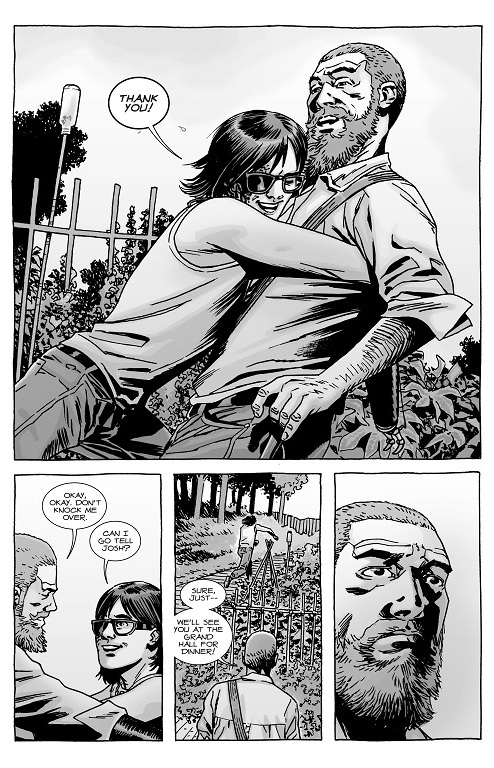 I like where Kirkman is taking the relationship between Rick and Carl. Rick can’t stop Carl from growing up, as much as he’d like to hold onto his little boy forever. Problem is that his little boy has grown up right before his eyes and seen some horrible things. Letting Carl take on an apprenticeship will not only give him something to do, but a sense of purpose. Since Carl lost his eye, there were moments where he doubted his ability to perform. Now, after watching others work to better Alexandria, he feels he can and should do more. It was a nice moment when Rick told Carl that he would be going to the Hilltop. This is something Carl’s wanted for a long time and now he’s got it. 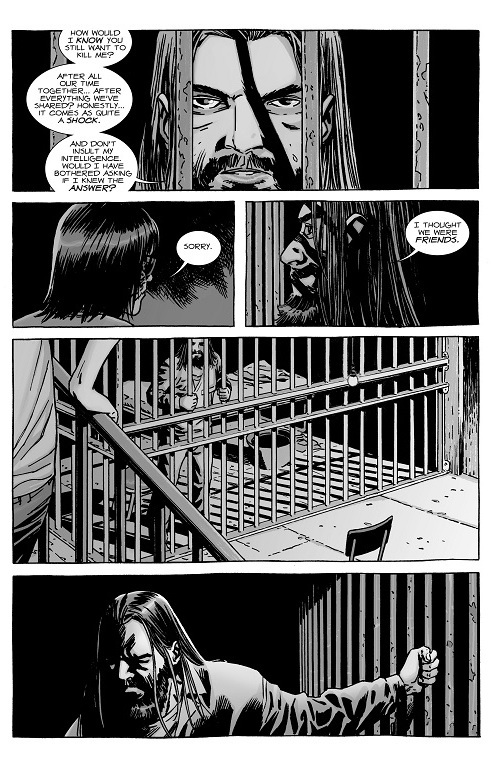 Now we’ll have to see where this leaves his talks with Negan. Is Negan fostering a bond in hopes of escaping? Who knows? As for Eugene and Rosita, I’m just hoping for some scene between the two of them. Other than that, I can’t say I’m too invested in their relationship, or the crumbling of it. Again, this issue was about reestablishing the characters we’ve watched grow, while also showing us the progress they’ve made. They’re rediscovering civilization in the midst of an ongoing zombie apocalypse. Now they find a group of wandering travelers, just like they used to be, and must establish trust if they’re to keep their civilization going. This entry was posted in The Walking Dead and tagged Andrea, Carl Grimes, Dr. Eugene Porter, Dwight, Heath, Jesus, Maggie Greene, Magna, Michonne, Negan, Rick Grimes, roamers, Rosita, survivors, The Hilltop, The Sanctuary, The Saviors, The Walking Dead, zombies by omarid513. Bookmark the permalink.